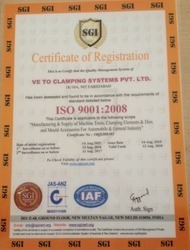 VE TO Clamping Systems Pvt Ltd, manufactures world class CLAMPING ELEMENTS, TOOL ROOM ACCESSORIES & CUSTOMIZED CLAMPING SOLUTIONS. Started with an idea of providing standard clamping systems for the Plastic Injection Moulding Machines, Sheet Metal Presses, Die Casting Machines and other Tool Room Industry. Today, we are proud to introduce ourselves as one of the leading manufacturer of Clamping Elements. The quest to stay ahead in the rapidly evolving market has made VE TO constantly develop new Product range as per compliance with different demands & needs of our consumers. From conceptualization to execution, from drawing to production, there's just one single largest force that drives us, our CUSTOMERS. We have grown from a small setup to an established brand name just because of customers. Our range of clamps are sold at economical prices in the market to our respected clients. Mission : To exceed our customers expectation in quality, delivery and cost through continuous improvement and customer satisfaction. Vision : To be the supplier of choice in every industry we serve. Purpose : Continues Value Creation for Customers. We are committed to offer our customers the best in class products that is why we have carved out a renowned place in the market. We are backed by a sound infrastructure facility and an efficient team that aids us in making the qualitative range of products. We also do assure the cost-effectiveness of the whole range of the products offered. We employ the best infrastructure facility equipped with latest machines to design and manufacture our products. We have segregated our infrastructural facility into various divisions so as to fasten the process of execution. We have best of the equipment that makes our product stand apart from what is available in the market. Our latest machines are in sync with best in class technology.